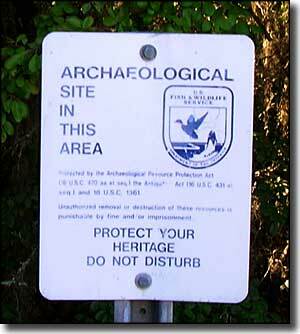 Shell Mound is an ancient Native American site at the southern end of Lower Suwannee National Wildlife Refuge. 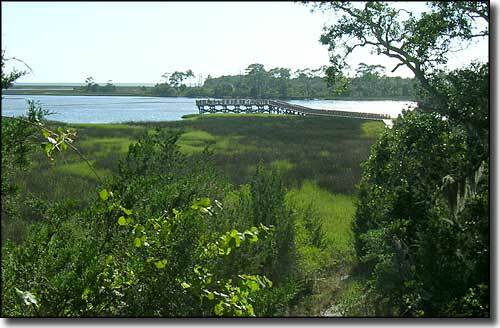 The primary shell mound is a construction of oyster and whelk shells plus fish, turtle and deer bones mixed with household debris built up over about 3,500 years (from 2,500 BCE to about 1,000 years ago) by Native Americans of the Archaic period and Eastern Woodland cultures. The mound itself covers about 5 acres and rises about 28 feet above sea level. 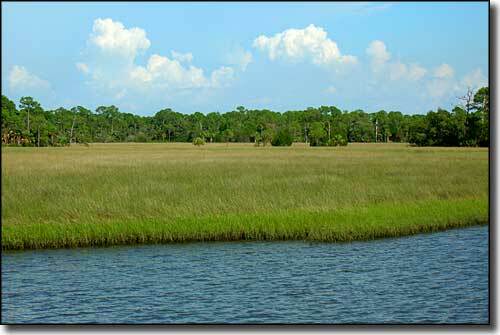 Before the protection of Lower Suwannee National Wildlife Refuge was in place, the mound was used by the county as a source of road building materials, but since coming into federal government ownership, it has been generally protected and even partially archaeologically excavated. These days, the mound sees only the foot traffic of about 60,000 visitors every year. And if there was no signage saying anything different, most folks wouldn't know if they were on the mound or off it. 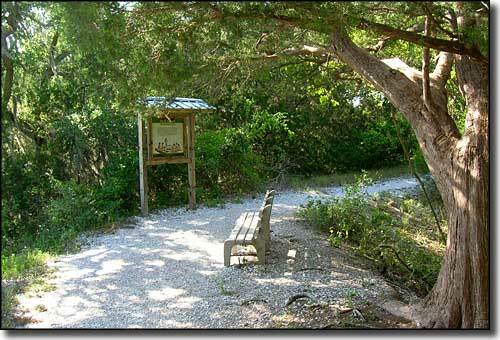 The area around Shell Mound has been developed into a nice park-like area with hiking trails and parking areas nearby. 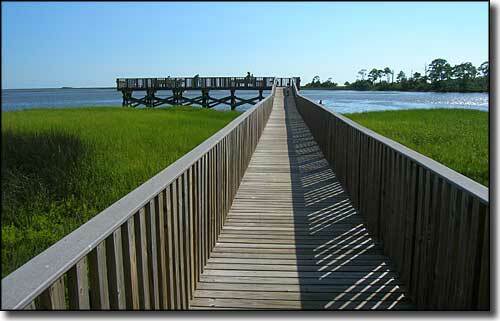 At the end of the road is a parking area that leads onto a boardwalk to a fishing pier built over the waters of the bay. Depending on the state of the tide, the bay area itself will vary from several inches to several feet deep, making this an excellent training area for beginning kayakers. 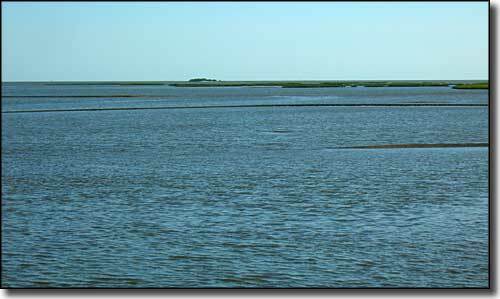 Beneath the water are several good oyster bars and some excellent crabbing and fishing. 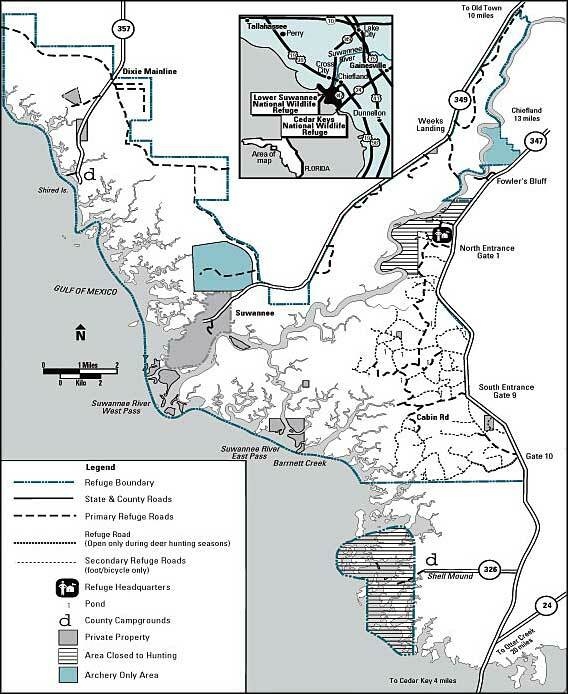 To the north and east is Lower Suwanneee National Wildlife Refuge, to the south is Cedar Key Scrub State Preserve, to the west is the Gulf of Mexico and Cedar Keys National Wildlife Refuge. 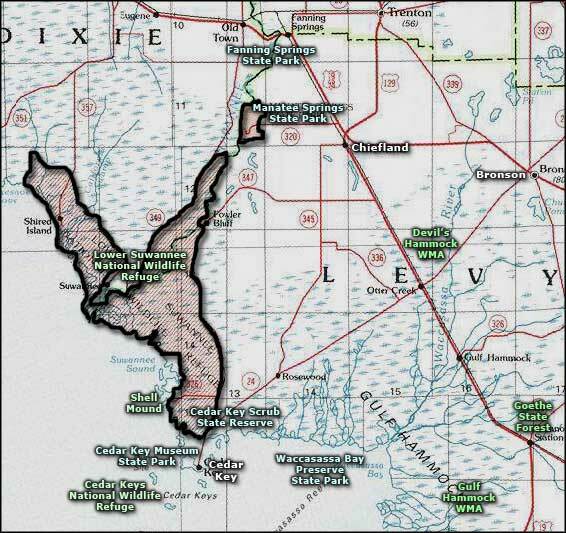 Upper area map courtesy of the US Fish & Wildlife Service. Lower area map courtesy of National Geographic Topo!